It was for a while I wondered if Data and Information are interchangeable. Actually, they are NOT, but when it comes to Architecture, almost everyone thinks (except for Information Architects) Data Architecture and Information Architecture are same. One of my colleague, who is now president of local DAMA chapter pointed me to DKIW pyramid. 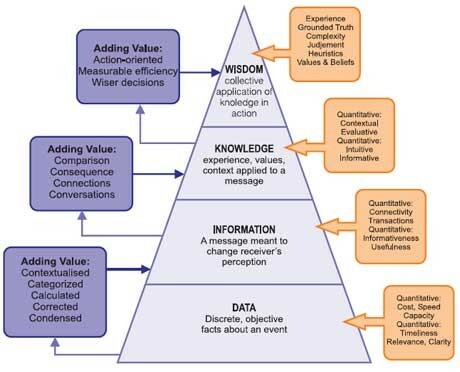 Using Ackoff and other references, the following are definitions of data, information, knowledge and wisdom, but according to Danny P. Wallace, a professor of library and information science, explained that the origin of the DIKW pyramid is uncertain. 2. The presentation of the relationships among data, information, knowledge, and sometimes wisdom in a hierarchical arrangement has been part of the language of information science for many years. Although it is uncertain when and by whom those relationships were first presented, the ubiquity of the notion of a hierarchy is embedded in the use of the acronym DIKW as a shorthand representation for the data-to-information-to-knowledge-to-wisdom transformation. Data: Often referred to as the lowest conceptual form from which information can originate, data are text, numbers, symbols, graphics or images that are representations of facts or properties of objects, events, and their environment. Data are individual facts that have no meaning by themselves out of context. Examples of Data: Green, an image of building. Information: Data in the context that provides perspective and meaningful insights for decision-making is Information. The term often addresses questions that begin with such words as who, what, when and how many. Examples of Information: Train velocity, wheel temperature, product inventory. Knowledge: This term describes a mix of experience, values, contextual information and expert insight that makes possible the transformation of information into instructions. Knowledge can be obtained either by transmission from another who has it, by instruction or by gaining it from experience. Knowledge often becomes embedded, not only in documents or repositories, but also in organizational routines, processes, practices, and norms. Examples of Knowledge: On-the-job training or experience, job shadowing, formal training courses, standard operating procedures or manuals. Wisdom: This term refers to the application of knowledge gained through learning and experience, the ability to make judgments or give advice based on previous knowledge, experience, and insight. Within an organization, intellectual capital or organizational wisdom is the application of collective knowledge. Examples of Wisdom: An example of wisdom is, “It rains because it rains.” This statement encompasses an understanding of all the interactions that happen between raining, evaporation, air currents, temperature gradients, changes and raining. Metadata is what gives your data a frame of reference. Forrester Research defines metadata as “the information that describes or provides context for data, content, business processes, services, business rules and policies that support an organization’s information systems.” For example, Apple Corporation’s App Store sells software applications online. The data, in this case, is the applications, or apps. The metadata is the information about those apps—an app’s description, price, user rating, reviews, and developing company. Operational metadata: furnishes information about the use of the data, such as date last updated, number of times accessed, or date last accessed. Metadata is the “who, what, where, how, when, and why” about data. It is the core information about data such as where to find it, how it got where it is, and its lineage (what systems produced or changed it). According to Gartner4, metadata unlocks the value of data, and therefore requires management attention. Unstructured—This is data found in e-mail, white papers like this, magazine articles, corporate intranet portals, product specifications, marketing collateral, and PDF files. Master—Master data are the critical nouns of a business and fall generally into four groupings: people, things, places, and concepts. Further categorizations within those groupings are called subject areas, domain areas, or entity types. For example, within people, there are customer, employee, and salesperson. Within things, there are product, part, store, and asset. Within concepts, there are things like contract, warrantee, and licenses. Finally, within places, there are office locations and geographic divisions. Some of these domain areas may be further divided. Customer may be further segmented, based on incentives and history. A company may have normal customers, as well as premiere and executive customers. Product may be further segmented by sector and industry. The requirements, life cycle, and CRUD cycle for a product in the Consumer Packaged Goods (CPG) sector is likely very different from those of the clothing industry. The granularity of domains is essentially determined by the magnitude of differences between the attributes of the entities within them. There are some criteria that can help you determine if Data you have can be used or viewed as Master Data. You can check for Behavior, Lifecycle, Cardinality, Lifetime, Complexity, Value, Volatality, and Reuse. These are criteria can be used together to decide if the data should be managed as Master Data. There are tools for Master Data Management, an entire domain on Information Architecture is devoted to describing Master Data Management. Wallace, Danny P. (2007). Knowledge Management: Historical and Cross-Disciplinary Themes. Libraries Unlimited. pp. 1–14. ISBN 978-1-59158-502-2. This entry was posted in Information and tagged Conceptual, Review. Bookmark the permalink.